Hi all. Looking for opinions on which is a better set to start collecting next. Clearly, I see the appeal of the 1952 Topps set, but the Leaf set has some great names that the 1952 set doesn't have (Dimaggio, Musial, Ruth, Williams) and both sets (in my opinion) are beautiful. Anyone have any strong opinions either way on pros/cons of collecting either? Is one much more rare than the other? Anything I'm overlooking that could/should make one a dealbreaker over the other? 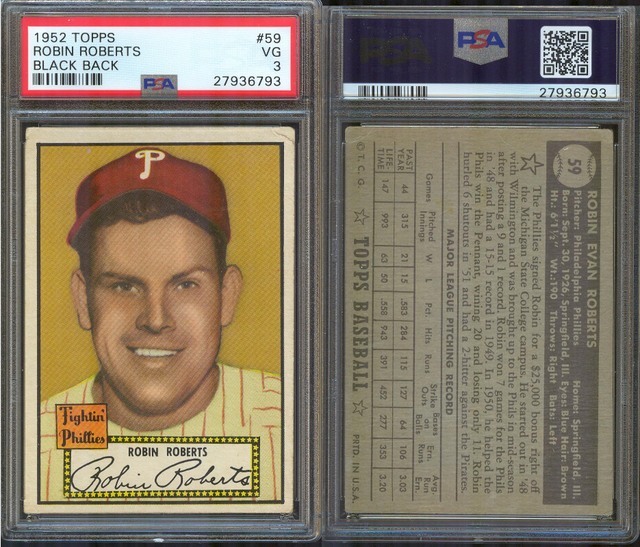 FWIW, I'd be going for PSA ~4 with the 1952 Topps and PSA 5 for the 1948-49 Leaf (I don't have six figures to put into this). Do you already have the '52 Mantle? If not, plan on about 25-30K for that card alone in PSA 4. The card may run even more if the eye appeal is great. If you're not prepared for that single expense, I believe the decision between the two sets ( 52 Topps or 48-49 Leaf ) is settled and you're building the Leaf set. Last edited by KCRfan1; 09-23-2018 at 09:51 PM. Well, if we're talking about single expenses, the Leaf set also has the legendary Paige card, which will also run quite the pretty penny in PSA 5. I'd rather have Leaf. Not as many commons to waste money on LOL. Williams, Musial and Robinson rookies, DiMaggio, and Paige I think marginally wins on player selection too, notwithstanding the 311. PSA Paige is 20k+ and much harder to find. You can pick up a Mantle whenever you want. You are also looking a 5k+ for a centered Jackie Robinson. The Leaf high numbers are also going to be harder to find and more expensive than 52 Topps. The 52 Topps will be an easier set to put together, you are just looking at 407 cards vs. 98. I personally would do the 1952 Topps set. However, I think the 1949 Leaf set is one of the ugliest sets ever made. I also can't stand the set being skip numbered. You will have card number 168, but need to figure out which 70 numbers don't exist. I also understand it is one of the classic sets in the hobby because of the Paige and Jackie rookie cards. I just did the 1949 Bowman set instead because I was doing a Bowman run and it had those two rookies plus others, such as Duke Snider, that Leaf didn't. 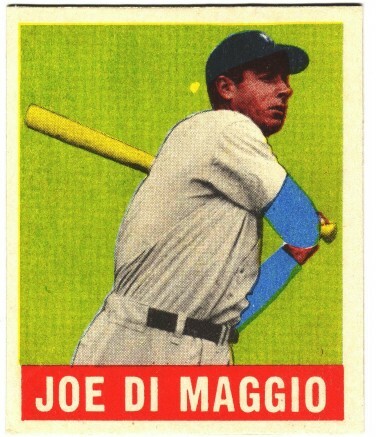 I really liked the 1949 Bowman, but I don't think it has Joe Dimaggio, Ted Williams and Babe Ruth (Obviously, Babe isn't a card while he was playing, but it's still a great card). Isn't Williams rookie the Playball? Yes and Musial is 1948 Bowman, 1949 Leaf is a "2nd year" card. Paige, Robinson, Doby, Kell and Newhouser are the HOF rookies in the set. All but Newhouser are also in 1949 Bowman. Last edited by Peter_Spaeth; 09-24-2018 at 12:15 PM. I believe the market still considers Leaf as a rookie card, no? 48 Leaf Ted William's a RC? I would assume no. LOL. No he was referring to Musial. That makes sense. I have considered the leaf Musial a RC and believe most of the hobby does as well. I voted for "doesn't matter" I like both sets for different reasons. There are certainly fewer Leaf cards, so as someone already pointed out, not as many commons to buy. Now if you get into varieties, Leaf is loaded with them. probably 4-5 versions of each of the regular cards. I haven't checked for them in the SPs, but Leaf was pretty* sloppy, so one or two on each wouldn't be a surprise. Of course, the Topps then has 2 Mantles, 2 of all the low numbers, and a bunch more. Their sloppiness was just more subtle. *"Pretty " sloppy = they apparently had no quality control at all. And the guys making the art into plates must have been totally hammered. Does the market still consider the 1952 Topps Mickey Mantle and Willie Mays cards rookies even though they had 1951 Bowman cards? I remember people calling 1987 Topps Mark Mcgwire and Jose Canseco cards rookies too. No, it doesn't, to my knowledge. But it's a different question, I am not arguing right or wrong, just asking what the market's view of it is and I think most people still consider Leaf to be a 1948 or 48-49 issue. Last edited by Peter_Spaeth; 09-24-2018 at 05:40 PM. Well Peter, most people are absolutely WRONG.....if they "consider Leaf to be a 1948 or 48-49 issue." 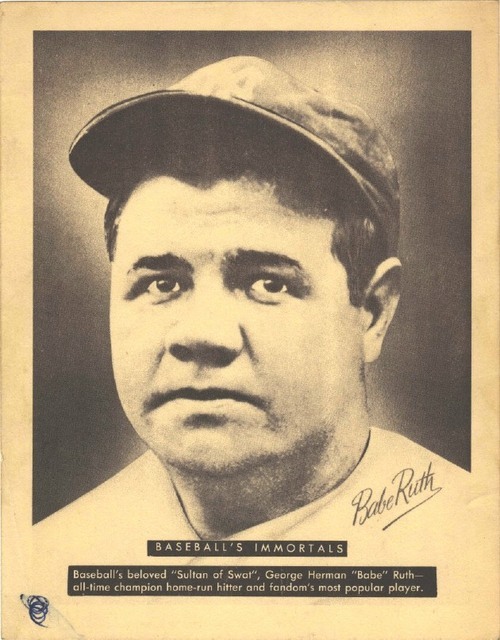 article (8 pages) which provides a history of the 1949 LEAF BB set. Short Prints) of 49 subjects (including Paige) of the LEAF set are extremely difficult to find. And of course they are quite expensive ($400 - 500 for commons). 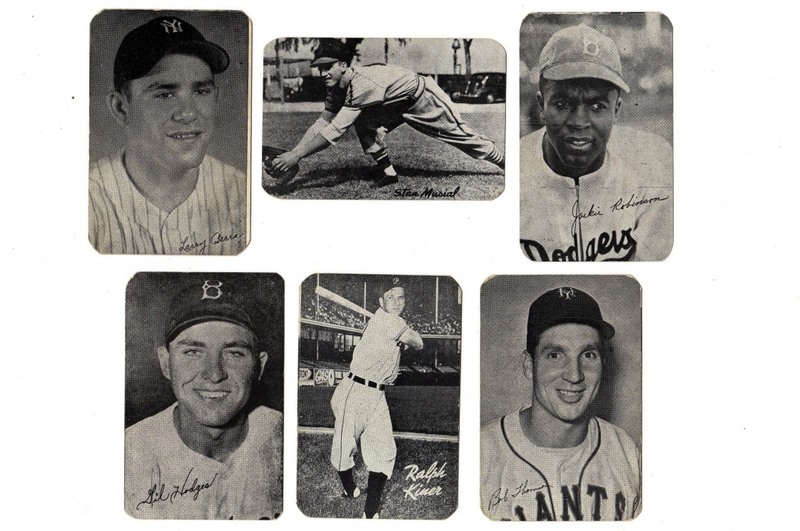 The true 1st cards of Yogi Berra, Gil Hodges, Ralph Kiner, Stan Musial, Jackie Robinson, and Bobby Thomson were issued in the 1947 BOND BREAD set (48 cards). These are my very first BB cards, which I collected as a very young dude. Ted, to your knowledge how did people get it so wrong then? It's not like this is ancient history or anything. Who started designating them as 1948 and why didn't someone immediately correct it as whenever it happened, surely there were many people who knew better? Last edited by Peter_Spaeth; 09-24-2018 at 10:23 PM. Some cards show a copyright of 1948 and some show 1949. I just did a quick search on ebay and read backs of 5 or 6 cards (far short of the complete set) and they reference stats from the 1948 season. Which would imply these would actually be, as Ted suggests, a 1949 issue. Gonna go read the article he wrote so I can learn more. To do a full Leaf set would cover all the variations and the SP's. The latter will eat up your wallet if you can find them and find them in better grades. The '52T, including the high series are more common, pricey, yes, but more common to find than the Leaf SP's. strictly a 1949 issue was acceptable to them. 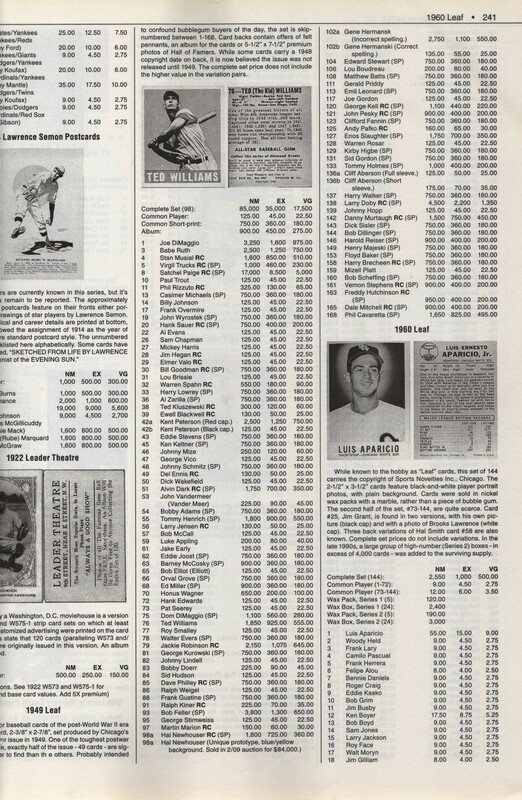 Meanwhile, Jim Beckett corrected his Price Guide to reflect a 1949 issue. 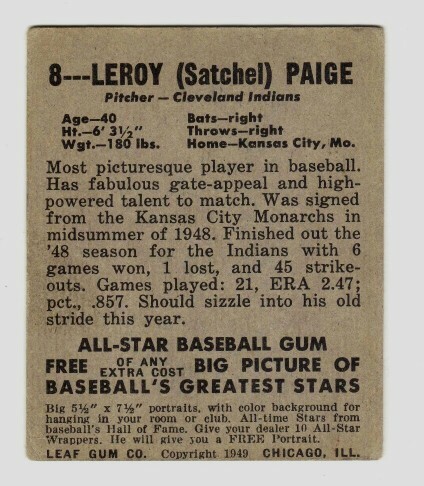 And, Bob Lemke's Standard Catalog of BB Cards also identified this LEAF set as a 1949 issue. Copyright date stamped in advance ? I don't think it is legal to stamp a 1949 Copyright on a product that was supposedly issued in 1948. Furthermore, certain bios of some of the subjects clearly tell us it was impossible for these cards to have been issued in 1948. One of the best examples of this is Lou Boudreau....A.L. 1948 MVP. Well, MVP awards were announced in mid-December 1948. Another example of this is shown here on the Satchell Paige card. Note the last sentence.... "Should sizzle into his old stride this year". Here is a LEAF printing detail that absolutely proves these cards were issued in 1949.....In 1948, the backs of Leaf's Boxing and Football sets were printed on WHITE cardboard stock. In 1949, LEAF switched to printing the backs of their BB and Football cards on GRAY cardboard stock. Duuuuh ! ! Are their any LEAF BB cards with WHITE backs ? ? Hey guys, I could go on, and on trying to convince you....but, it's bed time now. Have a Good Nite. Ted -- what about old price guides (I am sure they existed in the 50s and 60s) and old ads etc., what year did they identify the Leafs as being from? I just updated my 49 Leaf Spreadsheet with today's VCP prices. Using $26,000 for the Paige (i.e., there are no recent sales for PSA 5's), the price for a complete set (with variations) in PSA 5 is $65,999. If you want to round that to $66,000, you won't be too far off. Last edited by bobsbbcards; 09-25-2018 at 08:29 AM. Last edited by ALR-bishop; 09-25-2018 at 08:38 AM. Also, if I recall correctly Burdick, Frank Nagy, etc. referred to these LEAF cards as 1949.
seen a Copyright date stamped in advance ? I don't think it is legal to stamp a 1949 Copyright on a product that was supposedly issued in 1948. Kudos to SGC......they finally got it correct. These LEAF premiums (7" x 5 1/2") were enclosed in the 24-count wax-pack boxes under the wax-packs. 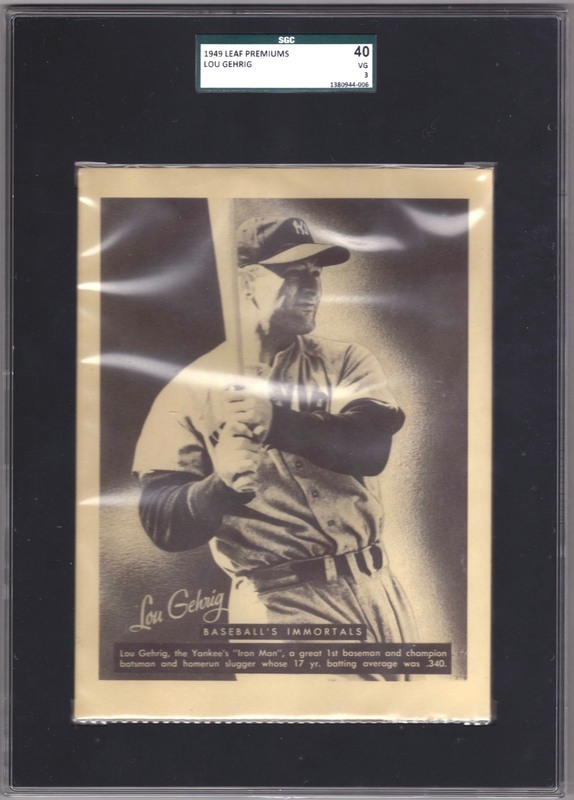 SGC identifies the LEAF BB cards as "1948-49 LEAF GUM CO." Very, very inconsistent ! ! When will these grading companies get it right ? ? Ted, I certainly would think that the copyright date would not be intentionally misrepresented, aside from legality what would be the point? But I guess the 1948 copyright on so many of the cards must be the source of the confusion. Last edited by Peter_Spaeth; 09-25-2018 at 12:24 PM. "Confusion" only to those unfamiliar with the production of this set of cards, Peter. obtained during 1948 (hence 1948 Copyright). And, the remaining players were obtained in early 1949 (hence 1949 Copyright). the hobby, and they concur with this release date (collectors from St Louis to Boston). I have never, ever met anyone who said they acquired these cards in 1948. We were all too busy collecting 1948 LEAF Football cards. Their Hi # series was issued circa December 1948. Grading companies are guilty of many mistakes. “Blaming” them for labeling 1948 Leaf baseball cards isn’t one of them. I collected cards back in the mid 70s and went to small shows along with the larger ones in Cincinnati and Plymouth, Michigan. EVERYBODY referred to these cards as “1948 Leafs.” This was at a time when the cards were only 30 years old. I have a hard time believing all of those hobby veterans were wrong. Well, I hate to jump in here, but if I had to listen to only one person on here with regards to postwar cards, Ted would be the guy. I have no reason at all to doubt Ted, but that's what's so confusing (to me anyhow), this isn't ancient history at all. It would be like someone today getting the date wrong on an 80s issue. that is certainly your choice. you can understand why people would choose not to just accept everything a person says as the truth, i hope. There are many on here who have a wealth of information that makes me envious but not many (that I am aware of?) can actually say they remember purchasing these cards when they were young. That in itself trumps others who are only going by what is written and what they heard from some other collectors who likely weren't around then or didn't collect back then. Words of wisdom Ronnie.... Ted is as knowledgeable as it gets and knows more than you forgot....Have a nice day! Last edited by CMIZ5290; 09-25-2018 at 07:21 PM. I do not collect the Leaf sets with the exception of 1960 but am aware of similar debates on the year of issue of some Topps test sets and Fleer issues from the late 60s an 70s. Dave Hornish has been a great source of info for me on those debates. Ted too, especially on Bowman sets. I find the debates interesting and enjoy reading them. For myself as a collector since 1957, the exact year of issue is not a crucial issue, but understand why it may be for others. In my last post on this thread I mentioned that I had looked at the backs of 6 cards from the set. I have since looked at another 20. All reference 1948 stats. Still far from every card in the set but it makes it hard to argue this was a 1948 issue when stats are showing from that season. I suppose an argument might be able to be made it was a 48 and 49 set is any of the other backs reference stats from the 47 season. Would not make a heck of a lot of sense for a card co to release a set, at the end of the calendar year, after the season concluded...Winter is a long time for baseball fans. that was kind of my point in referencing the baseball card shows from the 1970s. there were a lot of people in those rooms who collected cards in the 1940s and 50s. i'm not saying ted is incorrect on this one. just that it's ridiculous to think that professional graders are the ones who started calling them 1948 Leafs. everybody 40 years ago called them that. if ted remembers buying cards in the 1940s, i'm sure he remembers that fact from the mid 1970s. and i'll stick with my premise about not taking everything someone says as the gospel, whether it's ted or whoever. box that the LEAF cards were packaged in. SGC has correctly labelled it 1949 LEAF. But this is at variance with SGC's labelling of the LEAF BB cards as 1948-49 LEAF GUM CO. These two pieces should have identical labelling. This is a one example of how the grading companies are screwed up on this subject. This discussion has become tiresome. If some of you still question the information which I've imparted in these Posts, then counter it with some meaningful replies. Otherwise, take your "negativism" elsewhere. It's not needed here. on it. Contact Lyman Hardeman for back copies of this magazine. Thanks Dale (#30) and Al (post #35) for the kind words.....I really appreciate them. You make a great point here. And, anyone with modicum of common sense would realize this. Furthermore, I can add this fact to the argument.....LEAF launched their 98-card Football set in the Fall of 1948. The 1st series of 49 cards were available in October - November. printing tons of FB cards. Thanks Chase for your very astute input to this conversation. And, thanks to CMIZ5290 for your compliment. Leaf boxing was issued both with white and gray stocks. I am collecting a white stock set. The famous Graziano SP that was pulled very early in the print run, possibly before the cards were issued, is a white stock card. 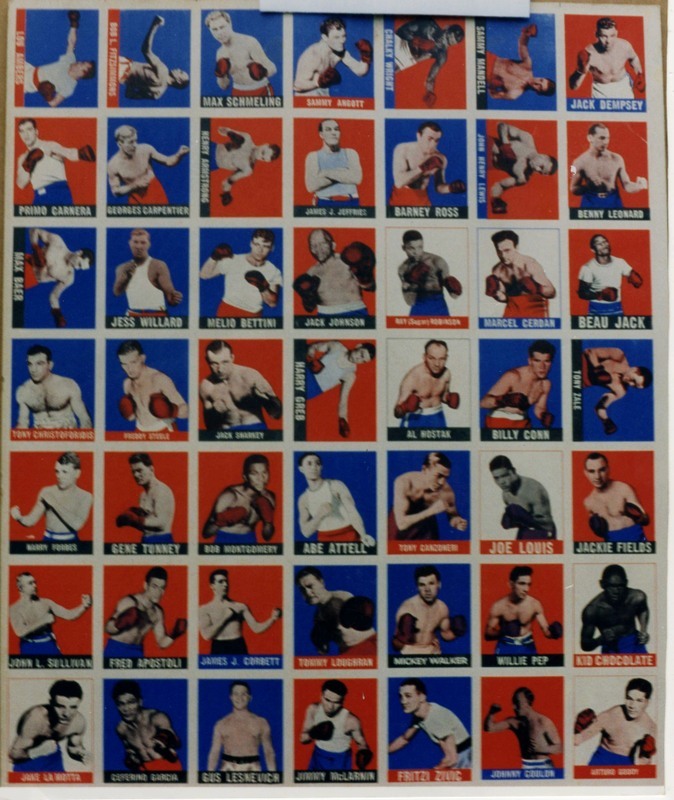 The 1948 LEAF boxing cards were the very first color Sportscards which I collected (at age 10). I completed both WHITE and GRAY versions. Graziano in their final match (KO in the 3rd Round) on June 10th 1948.
with both WHITE and GRAY cardboard stock. 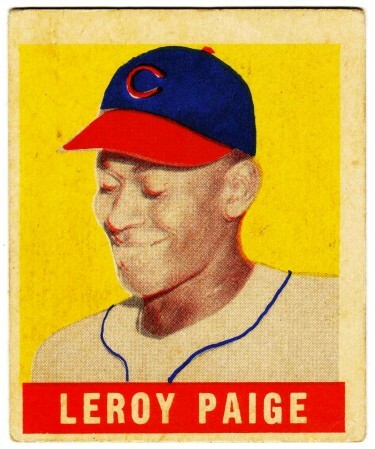 LEAF printers switched to GRAY stock in 1949 for their BB and FB cards (and these Boxing cards). 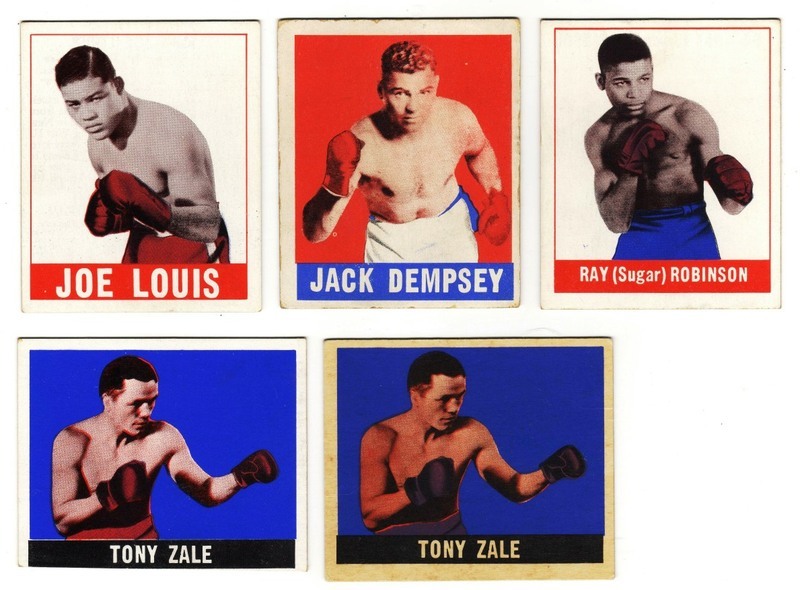 For those of you still yearning for a LEGITIMATE 1948-1949 set, this Boxing set is the one you are looking for. NOT the BB card set. Last edited by tedzan; 09-26-2018 at 08:09 PM. Reason: Correct typo. at blame for a cataloging error. PSA uses the catalogs as their reference and I know from personal experience they won't grade a card that isn't cataloged. as 1948 and the premiums listed as 1949 in the 2016 edition. 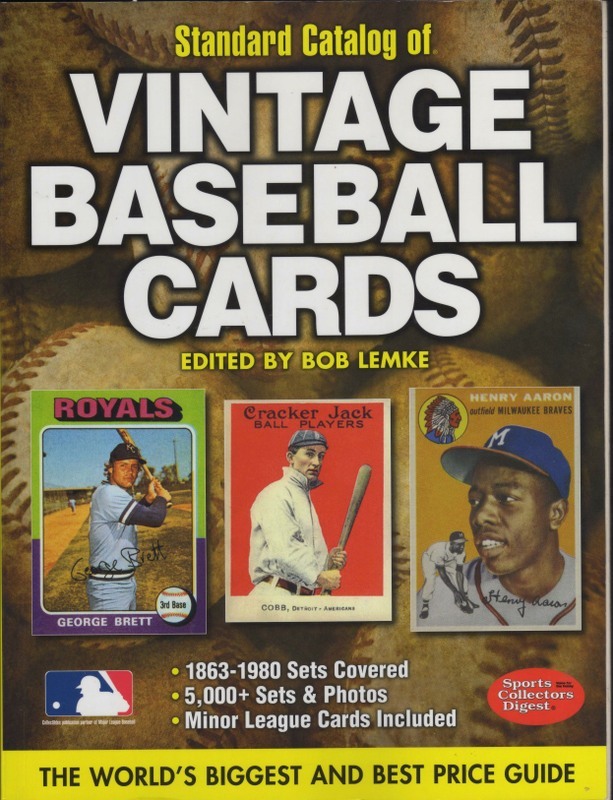 The STANDARD CATALOG of VINTAGEBASEBALL CARDS (Bob LEMKE) on Page 241 lists the LEAF BB SET as 1949. What catalog are you talking about ? Well, since Bob Lemke no longer edits this Price Guide, the LEAF BB card set has been INCORRECTLY changed to 1948. There was no one more knowledgeable than Bob Lemke when it came to BB card dates. This change is mis-leading. Anyhow. at least they have the LEAF premiums correctly dated as a 1949 issue. Which leads me to ask you this, Pat. LEAF packs. So, how can anyone in their right mind claim that these BB cards are not a 1949 issue ? And tell us.....what year do you believe these LEAF BB cards were issued ? ? I do miss corresponding with Bob over card issues, and still use the last Catalog he edited, along with the last Catalog with post 80 issues. Who is the current editor ? This is funny, because collecting in Illinois in the 70s, everybody called them 1949 cards. We were taught that the card year was the next year after the last year of stats. The cards had 1948 stats, thus 1949 cards. I find it hard to believe that no one in Michigan or Ohio turned the cards over and read the backs. This was my first 1949 Leaf card. The back reads "Made debut in 1947 as first baseman. Hit .296...chosen 'rookie of the year.' 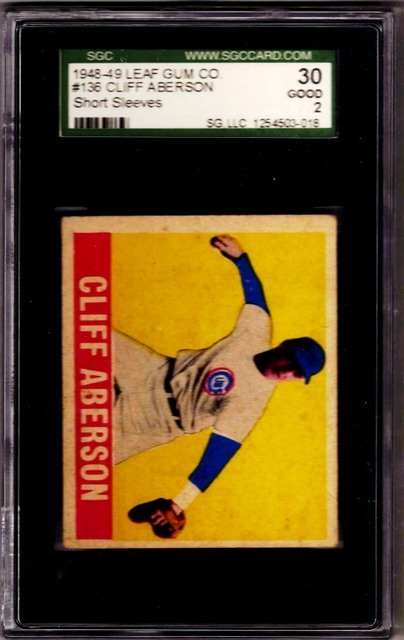 Last season again hit .296..." So as a teenager collecting in the 70s, the card has stats from 1947 and last year 1948, so the card is a 1949 Leaf. I am confused as to why this is so hard. Why would a company write last year in reference to 1948 if they made the cards in 1948? "Both are great, doesn't matter." Unfortunately, both of these sets even in lower grade are still way too expensive for me to make an honest effort at going after. 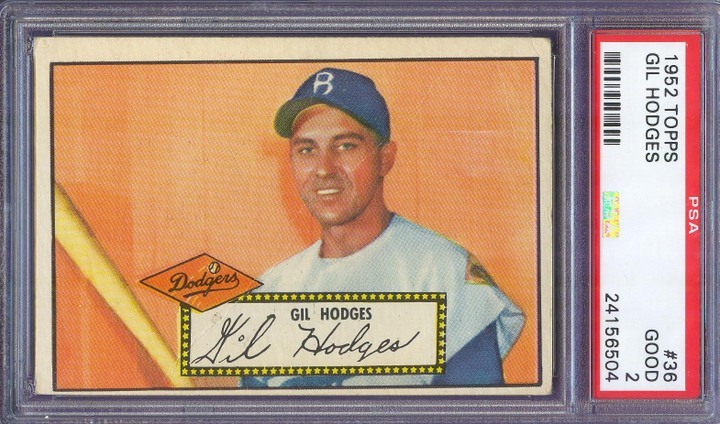 Right now I'm focusing on '56 and '67 Topps.